The periodic tables are available from the Home/Printables page in Adobe Acrobat PDF format. The PDF artwork is stored as lines and curves, not pixels, so it has very high resolution and will print crisply at any size, even poster sized! Printing the PDF document will give better results than printing an image file (like PNG, GIF, or JPG). When you click a link to a PDF, your browser may open the PDF in the browser's built-in PDF viewer, in which case you can simply use the Print, Save, or Download buttons. Alternatively, your browser may may download the PDF rather than opening it in a built-in PDF viewer. After downloading, it may or may not automatically open it in another PDF viewer, such as Acrobat Reader. You can also manually download the PDF by using the context menu (try right-click) on the link text, choosing an option like "Save Link As" or "Save Target As". You can open a downloaded PDF document in a PDF viewer, like Acrobat Reader. If you do not have Acrobat Reader, you can download it free it from Adobe. If you have problems, try using a different browser (with a different built-in PDF viewer) or try downloading the PDF and using Acrobat Reader. Elements in Pictures and Elements in Words are designed to go together as a set. Either will stand on its own, but they work best together. 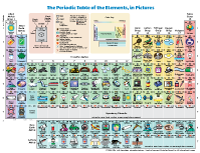 Elements in Pictures gets you hooked, and Elements in Words lets you learn more. 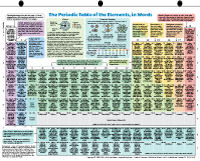 Elements in Pictures and Elements in Words are designed to be printed, in color, as the front and back sides of a standard American 11x8.5 inch letter-size sheet of paper or card stock. You can print this on the typical home color printer. Double-sided printing looks best with paper of higher quality (heavier, more opaque) or card stock. If your printer does not have a double-sided (duplex) option, you will need to print one side, then reload the printout back into the printer to print the other side. You may want to punch holes so it can be put in a notebook binder. You may want to print Elements in Pictures and Elements in Words on two single-sided sheets, rather than one double-sided sheet. You can then look at them side-by-side, or put them both on the wall. You can plastic laminate the paper to make it more durable. You can print Elements in Pictures and Elements in Words on two single-sided sheets placed back-to-back (or one double-sided sheet) inside a clear plastic sheet protector with notebook binder holes. This is an excellent method to make classroom handouts. The periodic tables will last for many years; the plastic holes won't rip. 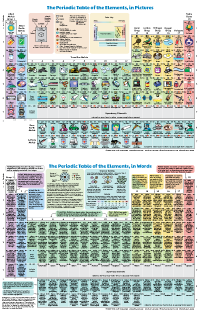 This allows you to pull out both periodic tables to view them side-by-side. You don't need to bother with laminating, nor printing on thick paper, nor double-sided printing. You can buy a box of sheet protectors at office supply stores or online (for example, Avery). Elements in Pictures and Elements in Words are best in color, but they have been designed so they can be printed and photocopied in in grayscale with only some loss of information. The main thing you will lose is the color coding of the groups of elements. If your copier increases contrast, making grays become black & white, it may be helpful to use a "lighter" setting; it is better for the grays to become white than to become black. 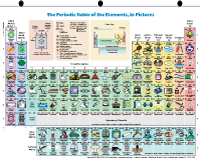 Elements in Pictures and Words exactly fits a standard American 11x17 inch ledger-size sheet of paper. One 11x17 inch sheet is exactly the same size as two 11x8.5 inch sheets. The PDF files were designed for American paper sizes (11x8.5 inch and 11x17 inch), but you can print them at international paper sizes (for example, A4 or A3) simply by using your "fit to page" and "center on page" printing options (the exact options to use will depend on your printer and software). You can print Elements in Pictures, Elements in Words, or Elements in Pictures and Words as posters of any size. The PDF artwork is stored as lines and curves, not pixels, so it is very high-resolution and will print crisply at any size. Printing the PDF will give much better results than printing an image file (like PNG, GIF, or JPG), especially at poster size. You can print the PDF file as a poster of any dimensions simply by using your "fit to page" and "center on page" printing options (the exact options to use will depend on your printer and software). You can print the PDF file at poster size at your local print & copy shop. It may be quite expensive to print large posters. Perhaps your employer, school/college, or other organization has a poster printer you can use at less expense. You can also buy posters online at the Wlonk Shop. Make the best use of your limited wallspace or money by posting a big Elements in Pictures poster, with a smaller Elements in Word printout at eye-level nearby, for people to read the more detailed information. You can print a cheap poster on multiple letter-size sheets and then tape the pieces together. Your printer software may have a "poster printing" option that automatically enlarges the image, and prints it piece-by-piece on multiple pages (for example, 2x2=4 sheets or 3x3=9 sheets). This is not very professional looking, but you can do it on your home color printer, so it is quick and inexpensive. 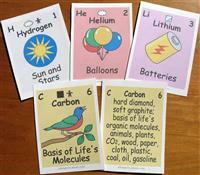 Print the elements cards double-sided on card stock. Cut out the cards with paper cutter or scissors. The PDF file has 32 pages (16 sheets) (8.5x11 inch), with nine cards per sheet (poker size, 2.5x3.5 inch). The downloadable zip file contains printing instructions. If you don't have a color printer, you can print the PDF file (double-sided on card stock) at your local print & copy shop. Print the elements sheets, one sheet per element, single-sided. The PDF file has one sheet per element. 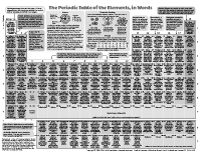 You can make a very large periodic table to cover a large wall. Or you can use the sheets separately, for example, each student chooses one element. If you don't have a color printer, you can print the PDF file at your local print & copy shop.